You should choose Guest House Vujevic if you want to stay in a peaceful location away from the center but still within walking distance. For the best rates book direct on the Guest House Vujevic website. For any special requests or general queries email the friendly manager directly. 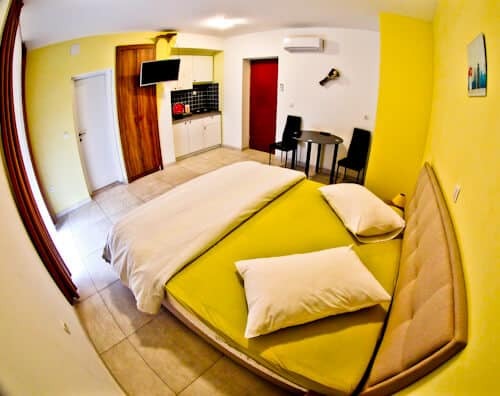 Guest House Vujevic is located in a peaceful residential area, 900 meters from Diocletian’s Palace. In addition there is a huge shopping mall and lots of restaurants close by. For those arriving in Split by car, guest parking is available. Afterwards you can forget about your car and explore the UNESCO sites of Split on foot. If you’re in town to watch a football match, you can also walk to the Hadjuk Split stadium from here. This is a family run guesthouse, it’s likely you’ll be checked in by the owner, or his son. As always with a family run guest house, there is a warmer, friendlier feel. Be sure to request a city map and restaurant recommendations when you check in. For those who wish to venture a little further than the UNESCO sites of Split, bike rental is available. The guest rooms are clean, spacious and modern. You may watch a wide range of cable channels on the flat screen TV. Temperature control is available from the air conditioning unit. A very useful feature is control of the main light from either the bed or the door. How many times have you had to get up to turn off the light in a hotel? In the guest house you can remain in bed and turn off the lights! The complimentary guest WiFi is fast and reliable with strong connection in the rooms. As with the modern, spacious rooms, the guest bathroom is also spacious and modern. Those who like to spend time at the bathroom mirror will be especially happy in this bathroom. I agree, it’s an average sized mirror but, the 3 additional mirror lights hugely enhance it! 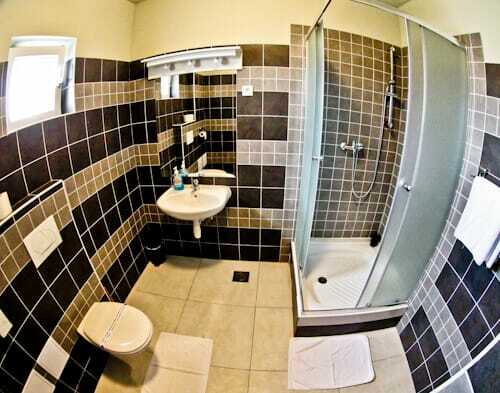 For solo male travelers in Split – this is the bathroom to have a shave! For couples traveling to Split, I’m sure the lady can accurately apply her makeup here. The kitchen makes it easy for those who need to control their diet. 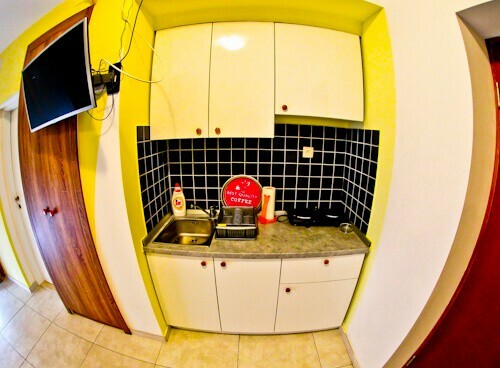 The fact you have your own kitchen makes the guest house vegan / vegetarian friendly, gluten free friendly, halal friendly etc… Those traveling to Split with kids can take advantage of the kitchen by cooking food the kids require. In addition to the kitchen, you have your own fridge. Cooking your own food can be beneficial if you are staying longer term. It’s much cheaper and healthier than eating out every day, not to mention much more convenient. In addition to the balcony, you have wonderful views of Split. 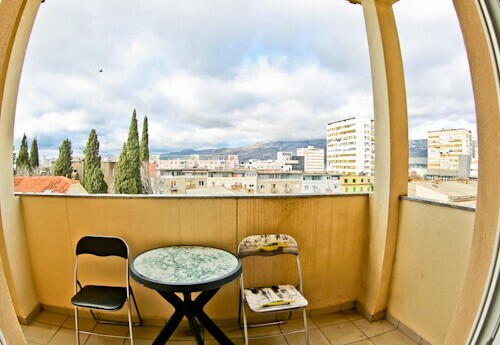 One side of the guest house offers panoramic views of the mountains of Split (above). In contrast, the alternative view is of the Mediterranean Sea which offers a beautiful sunset! Enjoy staying a friendly, family run guest house. Be sure to tell them your plans when you check in so they can best assist you with your stay in Split. 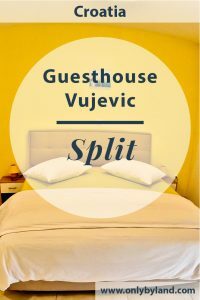 Split is a beautiful city, whatever your reason for visiting, Guest House Vujevic will make the perfect base. For the best rates book direct on the Guest House Vujevic website. For any special requests such as long term stays etc.. email the manager directly who will give a prompt reply. 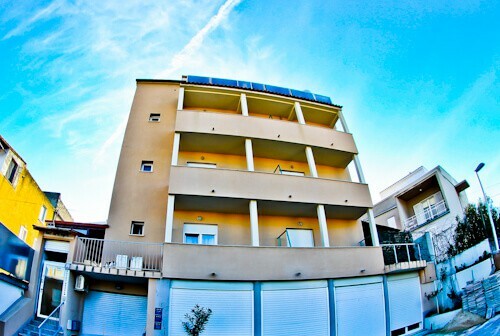 This looks like a fantastic place to stay whilst in Split. I love the idea of having your own kitchen, it gives you so much more independence. The room looks immaculate too! Hi Simon, I’ll definitely stay here again on my next visit to Split! I saw your amazing Split photo on Instagram and had to check out whee you stayed. It looks a pretty plush place! Yes, I witnessed a wonderful sunset whilst in Split – I think it’s the best sunset photo I’ve ever taken. My accommodation was excellent too!